Is it really possible to do Disney on a budget? With a little research and some preparation, there are lots of ways to save serious cash on your next Disney trip. Let TravelingMom show you all the tricks to saving money at Disney World and Disneyland! 1. Buy discount Disney tickets. 5. Cash in frequent flyer miles or hotel points. 6. Sign up for Mousesavers. 7. Sign up for Disney’s emails. 8. Take a refillable water bottle to the parks. 9. Bring your own stroller. 10. Bring your own parks gear. 11. Souvenir shop before your trip. 12. Make a grocery run. 13. Snack your way across the parks. 14. Spend a day doing non-park activities. 15. Skip the park hopper option. 16. Go right before your child turns 3. 17. Get a Disney Chase credit card. 18. Buy discounted Disney gift cards. 19. Enroll your kids in Y.E.S. 20. Pass on Photopass – but use the photographers! 21. Take advantage of Disney freebies. Disney vacations can be expensive for families. Airfare, park tickets, dining, hotels, souvenirs, and everything else can really add up. You don’t have to wreck your family’s budget simply because you want to take your kids to meet Mickey. I travel to Disney parks several times a year and use all sorts of tricks to save money along the way. It can be done! Research and planning are powerful tools for money-saving success in all kinds of travel, but they are especially powerful tools at Disneyland and Walt Disney World. After dozens of Disney trips (and a few money-wasting mistakes along the way) ,here are my very best tips for saving money at Disney destinations. Enjoy your ride on Thunder Mountain even more when you save money on your Disney vacation! Did you know that there are several authorized resellers that sell the very same Disney park tickets that Disney sells, but at a discount? These tickets carry the same perks and access that you would have if you purchased from Disney itself. TravelingMom recommends Undercover Tourist, which sells both Disney World and Disneyland tickets with a wide variety of options. For discounted Disneyland vacation packages that include tickets and a hotel (usually with special perks! ), Traveling Mom recommends Get Away Today. Even better, save $10 on a two or more night trip with code TravelingMom – just for our Readers. Disney hotels often have immersive theming and cool perks, but they are usually more expensive than equivalent off-property hotels not owned by Disney. Staying elsewhere can save you a lot, especially for larger families who need a suite or more than one room. Plus, at Disneyland, many of these inexpensive hotels are within walking distance of the parks! Hotel row on Harbor Boulevard, just a few minute walk to Disneyland. Wait, didn’t I just tell you off-site hotels are often cheaper? That’s true, but not always, particularly at Walt Disney World. 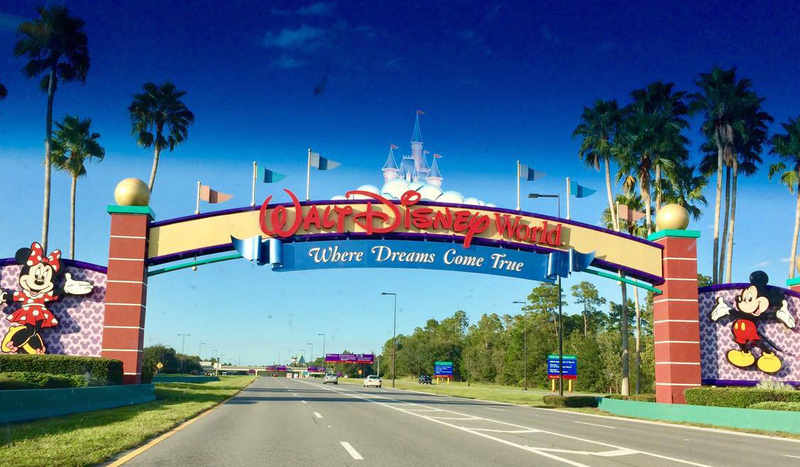 Don’t forget the freebies that being a Walt Disney World resort guest entails – free parking, free Magical Express airport transfers, and free transportation from your resort to the parks. If you can snag Disney lodging during a sale, particularly at a value resort around $100 a night, you can sometimes do Disney cheaper on-site. Disney is one of the few destinations that pays travel agents, which means there is no cost to you for using them. Travel agents often have access to and knowledge of the best deals, so it can even pay to use them. They can save you a ton of time, and time is money! Learn more about the benefits of using travel agents at Disney. Yes! You can see Cinderella Castle for less. Some of the biggest Disney trip costs are airfare and hotel, but there are ways to pay nothing for either of those aspects of your trip if you have miles and points in your loyalty accounts. If you are new to maximizing travel rewards, learn all the basics for travel hacking your Disney vacation. Then get even further details for using miles and points for Disney here. Mousesavers is a site devoted to saving money on Disney and other theme park vacations. Get on their newsletter for exclusive discounts and notifications when sales are happening. Disney has several sales and deals throughout the year – hotel discounts, free dining plan, and more. Sign up for emails from your favorite Disney park to make sure you don’t miss a deal as soon as it is live. Both Orlando and Anaheim can get hot, so you’ll need to drink plenty of water while you are in the parks. Pack a small water bottle and refill at water fountains or in restaurants throughout the day to avoid the cost of bottled water. More money left over for fun Disney snacks if you bring your own stroller & save! If you have kids under the age of 5, a stroller at Disney is a good idea even if they’ve outgrown using it at home. Rental costs from Disney are costly at $15 a day. Consider bringing an umbrella stroller from home or renting from a third party company like Magic Strollers with lower costs. Any essentials you need to buy at the parks will cost more than they will back home. Pack these if you can: ponchos, baby supplies, and even little extras like glow necklaces — and read here for 12 things to buy BEFORE Disney. Of course, if you are flying and suitcase space is at a premium, choose carefully! Let only the teacups make your head spin – not the thought of spending too much money at Disney! Disney licensed products can be found everywhere these days. Consider purchasing items like t-shirts, autograph books, and trinkets beforehand for a cheaper price. In my family, “Tinkerbell” brings each child a small gift each night we stay at Disney (usually purchased at Target for $1 apiece). This strategy drastically reduces the whining for pricey park souvenirs throughout the day. Dining in the parks every day for every meal is a budget buster. Eat a meal or two using supplies you can stock in your hotel room. Don’t have time to make a trip off-site to get groceries? There are several inexpensive grocery delivery services in the Orlando area or consider using Amazon Prime Now. You’ll still save a ton off of park prices even paying a small delivery fee. Epcot’s Flower and Garden Festival brings beautiful flowers but also cheap snacks! You can save a lot of money by simply making a meal of a few signature Disney snacks rather than a dining at a table service (or sometimes even quick service) restaurant. My favorite snack value? The giant turkey leg, hands down. Even more cheap snack options abound during special events like the Epcot Flower and Garden Festival (spring) or Food and Wine Festival (fall). There is a lot to do outside the parks, so save on a day of tickets by taking a theme park break. Instead, spend a day lounging by the pool, schedule a character meal at a non-park location, or explore Disney Springs (Downtown Disney at Disneyland). Check out TravelingMom’s best tips for enjoying a non-park Disney day for even more great ideas. Another way to save on ticket costs is to skip some of the add-ons, particularly the park hopper option. Park hopping takes time, particularly at Disney World, and might be too challenging for those with young kids or seniors in their traveling party. Visit Disney when your child is under 3 and still free! As soon as your children turns three, they will need a park ticket to visit all Disney parks. Child discounts aren’t huge savings off of the (very high) adult prices, so it really pays to go to Disney when your children are still free. Similarly, children need to pay adult prices once they turn 10, so go again while your child is still 9! Chase bank offers two Disney credit cards that frequent Disney travelers should consider. Using them earns Disney dollar rewards that can be used at Disney, but the bigger perk is the dining and merchandise discounts that come with using the cards. You can use Disney gift cards for nearly all of your expenses at Disney, including paying a vacation package before your trip. Getting those cards at a discount means you’ll save on nearly everything. There are a number of ways to get them: eBay, Gift Card Granny, Sam’s Club, or even grocery stores if you have a credit card that offers 5% cash back on grocery purchases. My personal favorite is getting cards at Target using the Target RedCard which offers 5% off Target purchases. The Disney Youth Education Series (Y.E.S.) is a great way for your child to learn while at Disney but it also entitles your family to ticket discounts. Combine a vacation and a learning experience for savings. Disney Photopass photographer working hard to get us all in the picture. Disney’s Memory Maker/Photopass service is great for capturing your Disney memories (I buy it almost every trip), but it simply doesn’t fit in every family’s budget. Even if you don’t purchase Photopass, photographers are happy to use your own camera to take a photo of you and your family. Although there are plenty of things in Disney parks that are expensive, Disney is exceptionally generous with certain freebies. Don’t miss this list of 13 free things at Disney World. How do you save money on your Disney vacations? Share your best tips on ways to save money at Disney World and Disneyland with us! COMMENTThanks for the great tips. I used Uber car service during my recent trip to Walt Disney World. We took a Uber from I Drive to the Disney Ticket and Reservation center at Magic Kingdom and it didn’t cost us anything, Free! We used a free ride code. Which was great! Our hotel did offer a shuttle bus to the park but we decided to use Uber cause we didn’t want to ride in a late and crowded bus as the shuttle had picked up passengers from adjacent hotels before it reached us. The driver picked us up within 4 minutes of requesting the car and we got to the Ferry terminal at Magic Kingdom about 15 minutes late. We also took an Uber back from the park to our Hotel at 11PM and the fare was just $9.50 for 4 passengers. The Uber driver was friendly, told us where he would pick us up and we went back to the hotel in a nice, clean, AC cooled car. Thank you for that tip! Waiting for the bus to take us back to the hotel after a long exhausting day at the park was unbearable! Especially for my 7 year old. Great idea! QUESTION: If we purchase tickets from Undercover Tourist, can they be linked to our arm bands? Will they be JUST LIKE the ones from Disney?